I came across Poochu and fell in love with all of the designs! All the harnesses are hand made and created by Miss Jackson and her two beautiful pugs, Jorge and Jose. Poochu offers a custom made service where you can request material you have in mind, however Luna's fabric was custom made for her! I'm amazed at how brilliant the moons came out! There are various sizes available but you can ask for a custom size too. Luna fits perfectly in a medium, although I think I will have to order a large once she is fully grown. Finding the right measurement for you dog is easy as there is a detailed chart to look at and find the correct fit. The detail on the harness is excellent, I mean look at that pocket, it has her name on it! The back has a D-ring where you can attach your lead and Luna's came with a little black bow which is a perfect final touch. Luna loves this harness so much. We were using a collar before, but she likes to pull on the lead a little so it wasn't suitable. This is perfect though, it keeps her nice and secure and makes her look pretty badass too. Luna's harness arrived super quick, even though there was a Christmas rush on. 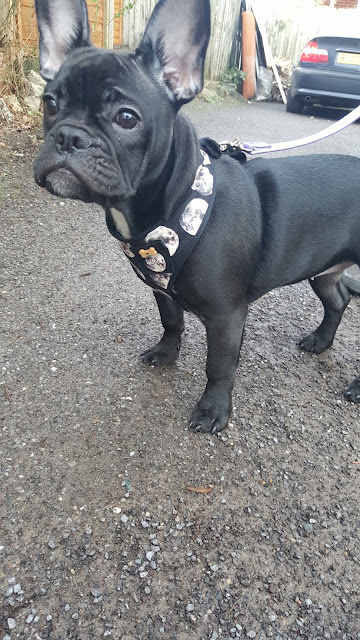 I'm so impressed by the service and quality of Luna's harness that I wanted to tell you all about it! Thank you so much Poochu, we will definately be back for more!